Melatonin is a hormone produced in the pineal gland of the brain that promotes sleep and regulates the circadian rhythm (sleep-wake cycle). In the body, the starting material for making melatonin is the dietary amino acid L-tryptophan. It undergoes a series of reactions with enzymes to become melatonin as seen below. Melatonin is naturally produced by the pineal gland in the brain. Melatonin supplements are synthetically manufactured and are molecularly identical to the natural form. Take a dose of 0.5 up to 5 mg of melatonin daily about 30 minutes prior to bedtime for jet lag or sleeping difficulty. It is important to note that the effects of melatonin are not dose dependent, which means the more you take doesn't help you fall asleep necessarily faster. Adjust the dosage accordingly. The top graph shows wakefulness, measured by video recording, and the bottom shows melatonin levels at these same times. Notice that melatonin peaks when wakefulness is at its lowest level. The Howard Hughes Medical Institute has a wonderful animation describing the regulation of your "biological clock" in the brain. The pineal gland is where melatonin is produced. 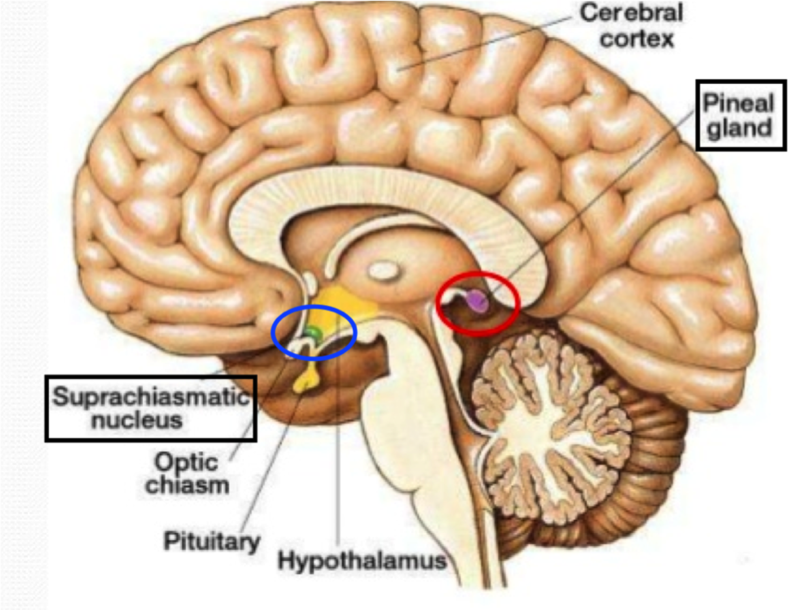 The suprachiasmatic nucleus is where it acts to regulate sleep. 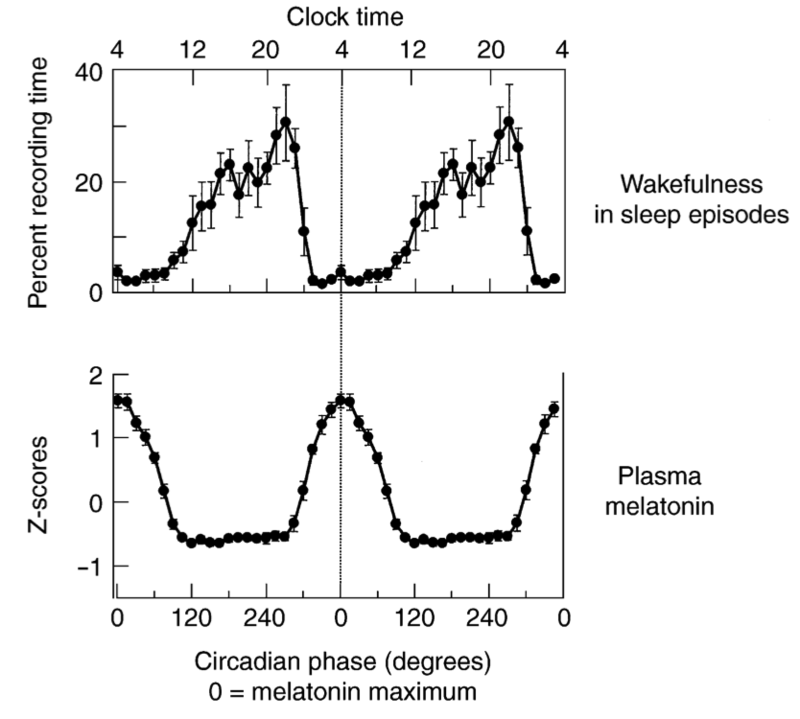 Another important use of melatonin is rescuing sleep-wake cycles that have been perturbed by light exposure. For those of us who spend countless hours in front of a computer, the blue light of the screen is particularly disruptive of our normal circadian rhythm. Melatonin at night may be beneficial for both maintaining desired sleep-walk cycle and resuscitating it after environmental disruption. Melatonin is categorized as generally regarded as safe (GRAS) by the FDA. Long term studies have shown that it is not habit forming and does not have deleterious effects with frequent use, even in adolescents.7Developing tolerance is also not an issue. Gubin, D. G., Gubin, G. D., Gapon, L. I., & Weinert, D. (2015). Daily Melatonin Administration Attenuates Age-Dependent Disturbances of Cardiovascular Rhythms. Curr Aging Sci.